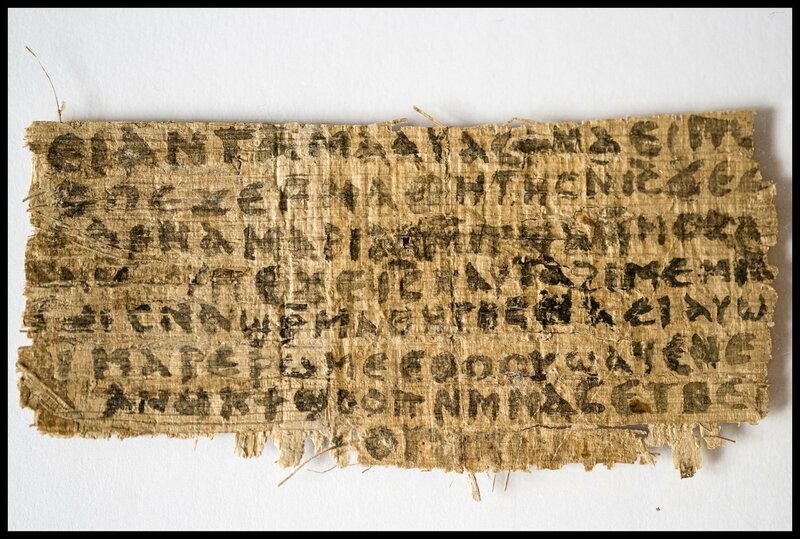 Two days ago the news "broke" that a fourth-century CE (300s) Coptic papyrus fragment suggests Jesus might have been married and—perhaps this is the part that's news; I can't tell—referred to her in public. 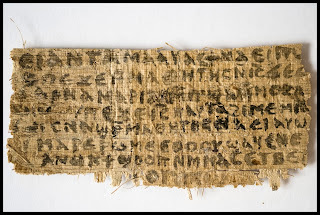 Karen King (Harvard University) has provided a lovely and very helpful and interesting webpage with pictures of the text, a transcription (for those of you with Coptic skills) and translation, a Q&A, and a pre-publication version of an article on this "new Gospel." The news story here—and there is one—is that we now have, apparently a new text that gives us a frustratingly brief glimpse of what some people in the (second? or) third century were saying about Jesus. That's a big deal, but it doesn't add to or change anything we know about Jesus himself. Those of us in this business get a bit tired of how stories like this get reported in the media. Quite honestly, who cares if Jesus was married? Where's the scandal in a first-century Galilean Jewish man taking a wife? So he's the son of God . . . where is it written that the human son of God had to be single or celibate? So the NT refers to the church as the bride of Christ . . . um, isn't that clearly a metaphor? So where's the scandal? Here it is: Our entire lives we've been told that Jesus was unmarried because no historical source with a claim to know such things mentions his wife. Moreover, those sources had no reason to hide it if he had been married! There's no embarrassment whatsoever that one of the two most well-known apostles—Simon Peter—was married (Mark 1.29–31; 1 Cor. 9.5), and had the historical Jesus had a sign on his mailbox, "Jesus and Mary Christ," I very much doubt that anyone in the earliest decades of the church would have cared. And if any of our Gospels—again, which had no reason to hide such things—suggested Jesus had a wife, then we today would live in a world where Jesus' wife would merit no more news space than Martha Washington (y'all knew George was married, right?). I have problems with this. Possibly theological but I can't think straight so I'll mention the one that I can think of: this is just really, really weird. I feel better now. I'd be curious to know what Bailey has seen in his studies of all those other ancient languages the Western church ignores. Also, if this were/is true, does that mean Jesus could relate more fully to the human experience? Would it make his interactions with certain other women more scandalous?